How does the topping rescue the beef? The taste of a burger pattie is never that good or that entertaining on its own, even a well made, hand packed, freshly ground, medium rare burger pattie. Sure it could be well seasoned. Sure it could be beefy. But I challenge you the next time you eat your favorite burger, eat a few forkfulls of just the patty, and tell me how much you liked it. It's boring. And if it is medium or medium rare, its should have a certain fishy raw taste to it. But, with the acidity in the tomatoes, the sharpness of strategically placed thin raw onions and/or mustard, the sweetness of the ketchup, the starchiness of the bread to soak up the fat? The beefy goodness comes alive. There is a reason beef tartar has mustard, onions, capers, etc mixed in. Raw minced beef on its own doesn't taste that good. 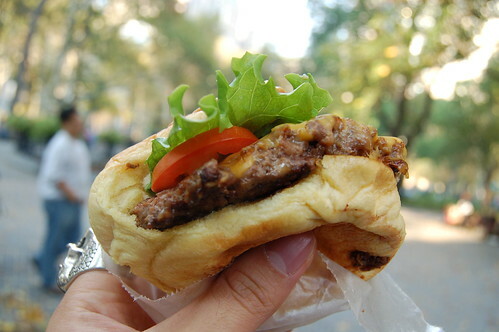 A burger, is truely something that is greater then the sum of its parts. The heart of the burger, the patty, is simply not enough. It desperately needs all the support it can get. So what is a good choice for your burger topping? Ask yourself what are the baseline things that your patty needs to taste good. Everything beyond that baseline... are just songs, dance, and juggling monkeys to distract you from what else is going on.